Benoist Korn-Type XII on display at the Steven F. Udvar-Hazy Center. This object is on display in the Pre-1920 Aviation exhibition at the Steven F. Udvar-Hazy Center in Chantilly, VA. In the spring of 1912 Thomas Wesley Benoist announced the completion of his firm's newest aircraft, the Type XII. It was a two-place tractor biplane, powered by a Roberts six-cylinder, 75-horsepower engine. It was one of the first closed-fuselage tractor airplanes to appear in the United States. Perhaps five Type XII aircraft were produced by the Benoist factory during the next year. The NASM Benoist Type XII was constructed in the Benoist shop in St. Louis by its purchasers, Edward and Milton Korn. The Korn brothers began work on their airplane in March 1912. It was completed on May 20, and it was flown soon thereafter at Anna, Illinois. During the following year, the Korns performed numerous exhibitions with their Benoist. 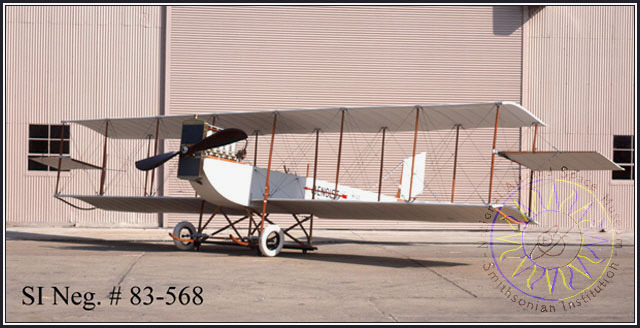 Most American aircraft produced during this period were close copies of Wright, Curtiss, or European machines. Benoist was one of the very few U.S. firms building and selling original designs in the pioneer era. In the spring of 1912 Thomas Wesley Benoist announced the completion of his firm's newest aircraft, a two-place tractor biplane. Powered by a Roberts six-cylinder, 75-horsepower engine, the airplane was the first tractor produced by Benoist and was one of the first closed-fuselage tractor airplanes to appear in the United States. The new machine was identified as the Type XII. Perhaps five Type XII aircraft were produced by the Benoist factory during the next year. In December 1912, one of these airplanes, mounted on floats, made a highly publicized 3,157 km (1,973 mi) flight down the Missouri and Mississippi rivers, with Tony Janus at the controls. The other Type XII machines were sold to private exhibition pilots. The NASM Benoist Type XII (factory No.32) was constructed in the Benoist shop in St. Louis by its purchasers, Edward and Milton Korn. The Korn brothers began work on their airplane in March 1912. It was completed on May 20, and it was flown soon thereafter at Anna, Illinois. During the following year, the Korns performed numerous exhibitions with the Benoist. One important modification to the controls was made in this period. The ailerons fixed to the outer wing struts at the midpoint (warping, not moving ailerons) were replaced by normal ailerons hinged to the trailing edge of the upper wing. The flying career of the Korn-built Benoist Type XII ended on the morning of August 13, 1913, when the Korns crashed while flying near their grandfather's farm at Montra, Ohio. Five days later, Milton Korn died from his injuries. Edward, the pilot, was badly hurt but recovered. The remains of the Korn Benoist were placed in storage after the accident. In 1917-1918, Edward Korn allowed a group of manual arts students to rebuild the Benoist, but apparently it was not flown. During the course of the rebuilding a great many alterations were made to the original Benoist design. Of particular note was the substitution of a fuselage and tail having a different configuration than that of the original. At least three of the wing panels were repaired with different sized material. 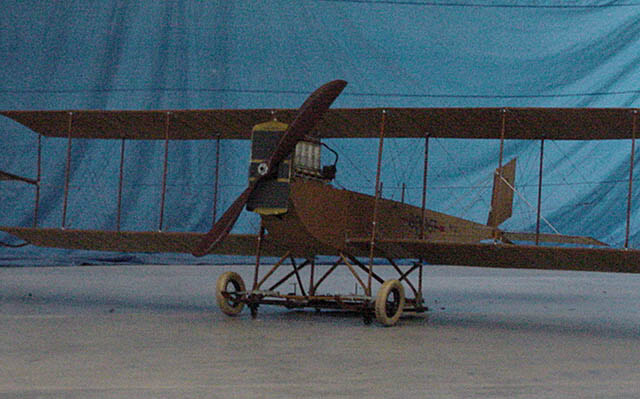 After the airplane was reconstructed during the First World War, the Benoist was broken down and stored at Korn Airport in Jackson Center, Ohio. It remained there until Edward Korn donated it to the Smithsonian Institution in 1949. It was initially taken to a facility in Park Ridge, Illinois, which the National Air Museum then utilized for storage, and then moved to Washington, D.C., in 1951. The Korn Benoist Type XII was restored by NASM in 1981-1982. It was returned to its original 1912 factory-built configuration. The NASM Benoist Type XII is an extraordinarily significant early airplane. It is a prime example of pre-World War I U.S. aeronautical technology. Most American aircraft produced during this period were direct copies of Wright, Curtiss or European machines. Benoist was one of the very few U.S. firms building and selling original designs in the pioneer era. Gift of Dr. Edward A. Korn. Tractor biplane with one 75-horsepower Roberts 6X six-cylinder engine. When the aircraft was restored, a rubberized finish was applied to the fabric to replicate the original. Over time, the finish has oxidized, resulting in an overall brown color. The photo of the Benoist-Korn with the overall white color shows the airplane as it appeared upon completion of the restoration in 1982, before the oxidation began.